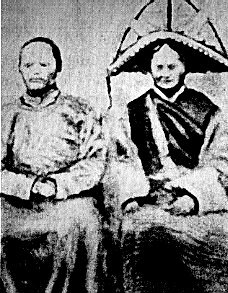 It all began in 1937-1938, in the mountains of Baian-Kara-Ula, the remote, uninviting slopes located on the border that divides China and Tibet. An archaeological expedition, led by the highly respected Chi Pu Tei, discovered a number of unique cave burial sites. 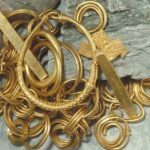 What he and his team found in these previously unknown caves would soon be considered as something highly unusual.For many it would represent one of the greatest discoveries of the century, and change everything they perceived about their distant past and their origins as a people. 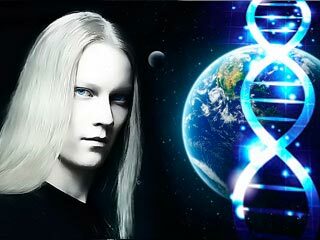 Those who believed in the Genesis of the Bible only saw the so-called “scientific evidence” as possible proof of another creation of God intruding into Mankind’s domain. By faith, this domain and any other living, thinking beings came from the one God worshiped by Christian and Jew alike. Chi Pu Tei, a professor of archaeology at Beijing University, directed the archaeological survey of a series of interlinking caves. 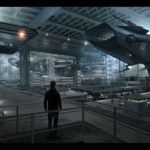 In a report he noted that the “caves” may have been artificially carved, and were more like a complex system of tunnels and underground storerooms. The walls were squared and glazed, as if cut into the mountain with a source of extreme heat. Inside the caves were several ancient, but neatly arranged burial sites, and in them the skeletal remains of a people; a strange people. The skeletons, measuring a little more than four feet tall, were found “frail and spindly” with “disproportionately large” skulls. At first it was suggested that these might be the remains of an unknown species of mountain gorilla. Fellow researchers initially ridiculed Tei’s published findings. The concept of gorillas burying their young was preposterous, but that left one important question to ponder: “What kind of human beings could these people have been?” “Were they human at all?”More discoveries made deeper in the connectiing caves eliminated the possibility that apes had lived there. On the walls carved pictograms of the heavens were found. The Earth, the sun, the moon, and the stars were there, and all were connected by pea-sized dots. 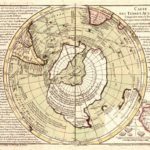 It was obvious that the pictures were meant to be a map or chart of some kind, and that they were created by intelligent beings. 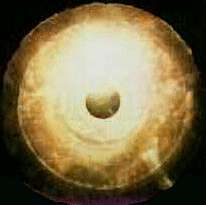 One of the best preserved disks was dated to between 10,000 and 12,000 years BC old, older by far than even the oldest estimates of the age of the great pyramids of Egypt. This was incredible news, but what was to come would be even more remarkable. A final total of 716 such plates were found, and each held its own mystery. The grooves, upon closer inspection, were not grooves at all, but a continuous line of an unknown writing! Shortly after World War II, a Polish professor named Lolladoff showed one of the ‘stone disks’ to British scientist Dr. Karyl Robin-Evans, who helped bring the story to the western world. Lolladoff claimed to have bought the disk in Mussorie in Northern India and that it was supposed to be from a mysterious people called the “Dzopa” (or “Dropa”) who had used it for religious rituals.Robin-Evans would follow the trail of the Dropa to its origins, and was able to take a rare photograph of the Dropa leaders in 1947. 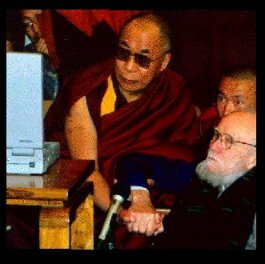 His visit with the Dalai Lama was legendary, and provided a wealth of information on the reclusive, unique tribe of people. Many experts tried to translate the hieroglyphs in the 20 years the disc lay in Peking. They all failed. It was not until another professor, Dr. Tsum Um Nui, broke the code and started to decipher the ‘speaking grooves’ that the full implications of the disc were realized. Realized, that is, only by a select few. The outside world remained in ignorance. For the professor’s conclusions on the meaning of the disc were so shattering that they were offically suppressed. The stone disks told an astonishing story of a ‘space probe’ by the inhabitants of another planet which came to crash in the Bayan-Kara-Ula mountain range. 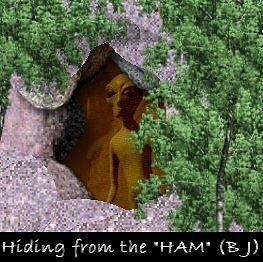 The strange, spiral script told how the peaceful intentions of the ‘aliens’ had been misunderstood, and how many of them were hunted down and killed by members of the Ham tribe, who lived in the neighboring caves. According to Nui, one of the lines of the hieroglyphs read,“The Dropas came down from the clouds in their aircraft. The men, women and children of the neighboring peoples (Ham) hid in the caves ten times before sunrise. When at last they understood the sign language of the Dropas, they realized that the newcomers had peaceful intentions…”. Another section of the writings expressed ‘regret’ by the Han tribe that the aliens’ spaceship had crash landed in such a remote and inaccessible mountains and that there had been no way of building a new one to enable the Dropas to return to their own planet. In the years since the discovery of the first disk, archeologists and anthropologists had learned more about the isolated Bayan-Kara-Ula area. Much of what they learned seemed to corroborate the bizarre story recorded on the discs. Legend still preserved in the area spoke of small, gaunt, yellow faced men who ‘came from the stars, long, long ago’. Russian archaeologists are puzzling over a remarkable collection of stone discs, thousands of years old, found in the mountains bordering China and Tibet. 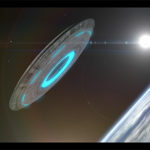 So hard is it to explain them in terms of earthly experience that the archaeologists do not rule out the possibility that the discs may have come from outer space. A total of 716 discs, like Stone Age gramophone records have been picked up in recent years by men exploring caves in the Bayan-Kara- Ula mountain range, reports the Soviet Union's new English-language magazine, Sputnik. Each disc has a central hole and irregular grooves spiraling out to the edge, but the report says (quite seriously) that the groves are not sound tracks. It is thought that they are some form of ancient writing, but scientists have so far failed to decipher them. 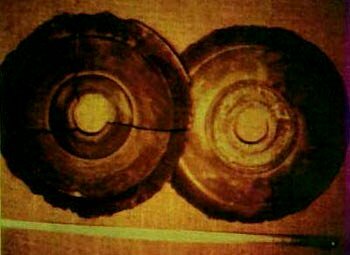 Chinese archaeologists estimate that the discs are about 12,000 years old, but have made no headway at all in trying to explain their purpose or how they came to be in the caves.The Russians, who have examined some of the discs in a Moscow laboratory, claim to have made two important discoveries. One is that the discs contain certain traces of metal; particularly cobalt. Secondly, when placed on a special turntable they hummed in an unusual rhythm like an electrical charge was passing through them. 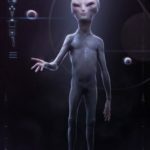 In 1968 the russian scientist W. Saitsew published a paper which raised a lot of interest in the subject of nonterrestrians visiting earth in the past. Some of the information presented in his paper were based on the work which Professor Tsum Um Nui had done in 1962.For several years, nothing was heard of the disks. 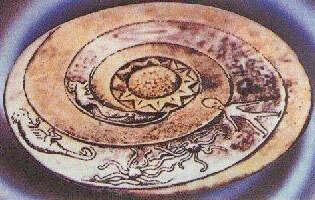 Then, in 1974, an Austrian engineer named Ernst Wegener came upon two of the disks in the Banpo Museum in Xian. The museum director could tell him nothing about the disks, which had begun to deteriorate, but she allowed him to touch one of them and to photograph them. He did so, but he had only a Polaroid camera with him. These photos are the ones that we see often reprinted today. In 1994, when Hartwig Hausdorf was in China, he asked the current director of the Banpo Museum about the disks and was told that they had disappeared. Today, the isolated area between Tibet and China is inhabited by two tribes of people who, in fact, call themselves the Dropa and the Han. Once enemies, these two tribes now co-exist peacefully. Anthropologists have been unable to categorize either tribe into any other known race; they are neither Chinese nor Tibetan. Both tribes are of pygmy stature, adults measuring between 3-foot-6 and 4-foot-7 with an average height of 4-foot-2, and body weights of 38 to 52 pounds.